See more objects with the tag architecture, interior, illusionistic, domestic, home, borders, domestic interiors, drapery, swags, molding, trompe l'oeil, frieze, imitation. See more objects with the color darkkhaki darkgrey sienna saddlebrown darkolivegreen or see all the colors for this object. This is a Frieze. 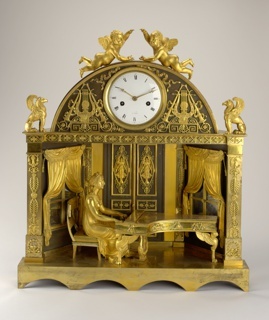 It is dated 1810–20 and we acquired it in 1928. Its medium is block-printed on handmade paper. It is a part of the Wallcoverings department. This frieze simulates a drapery festoon containing an embroidered border, above a simulated cyma reversa molding enriched with acanthus leaves and palmettes. The intent of this type of drapery swag was to be used at the bottom of the papered wall, as one part of a three part installation. 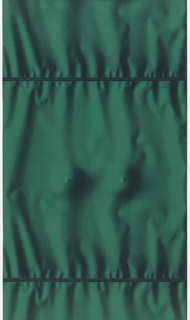 A border at the top of the wall would contain a printed hanging rod and drapery pleats, while the main sidewall paper would continue these pleats and folds down the wall meeting up with the pleats in the bottom border. 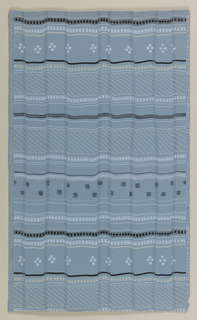 These printed drapery swags were also used alone as a frieze or top border paired with a patterned sidewall paper. 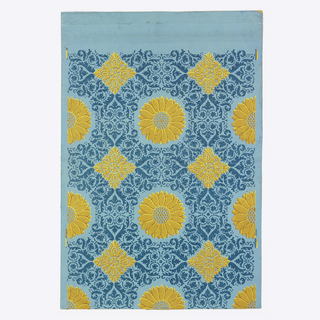 This drapery swag was reproduced and used in a restoration of the Blue Room in the White House.